Flu season is here. In addition to simple hygiene measures, your best bet for avoiding influenza and possible complications is an annual flu vaccine. To protect you and your family, the Center for Disease Control (CDC) recommends an annual flu vaccination for everyone age 6 months and older. Flu shots are especially important for people at high risk of influenza complications, including pregnant women, young children and older adults. Myth #1: The flu vaccine can give you the flu. Most flu vaccines only contain dead viruses so it cannot infect you. Despite this fact, some people continue to believe this flu shot myth. 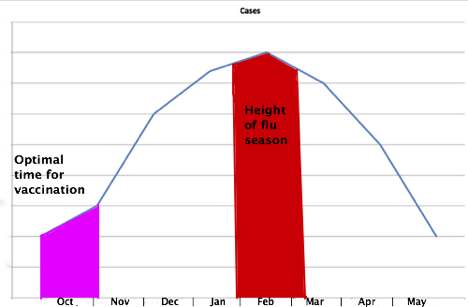 Flu season (October-March) coincides with a time of year when cold viruses are in the air. When people get sick with a ‘common cold’ around the time they get a shot, they blame it on the flu vaccine. For the peace of mind of our patients, at Little Silver Pediatrics & Family Medicine we use only preservative-free flu vaccines made from killed viruses. Myth #2: If I’m young and healthy, I can’t get the flu. There is a common myth that the flu is only dangerous for the elderly. While seniors are more vulnerable, the flu is risky for anyone – even healthy adults and children. Some of the most susceptible people to seasonal influenza (flu) include pregnant women and young children. Children under 6 months are most at risk because they are too young to get a flu vaccination. To protect infants from the flu, we recommend that parents, older siblings and other caretakers for the baby get a flu vaccination. Myth #3: Young and healthy people don’t need a flu vaccine. If you are in good health, you may be at “low risk” for getting serious flu complications. But, low risk is not the same as “no risk”. Hundred-year storms do happen and folks in good health do get the flu. By your failure to get yourself vaccinated, and risking the flu, you may miss out on that important get-together with friends and family. More importantly, your failure to get vaccinated may endanger the well-being of your friends and family during the holiday season. Myth #4: You can skip years between flu vaccinations. Because the strains of flu that are dominant change annually, a new vaccine is reformulated or developed every year to protect us from flu. The 2013-2014 flu vaccine protects against this year’s seasonal flu and the H1N1 (swine flu) virus that spread around the world in 2009. Myth #5: It’s not safe to get a flu vaccine during pregnancy. The flu vaccine is safe at any time during pregnancy. The American College of Obstetrics & Gynecology urges pregnant women to discuss with their obstetrician and consider getting the flu vaccine to protect themselves and their unborn child. Getting the flu vaccine not only protects your baby during pregnancy, but also in the first few months of their life until he/she is old enough to get the vaccine. For more information on Flu and Pregnancy, visit the March of Dimes website. Are you pregnant or planning a pregnancy? Please talk to your obstetrician. You may also call us to schedule an informational visit with one of our physicians to learn how to protect you and your baby from the flu this season. Call us at 732-741-5600 to schedule a flu shot appointment. For the peace of mind of our patients, at Little Silver Pediatrics & Family Medicine, we use only the preservative-free flu vaccines made from killed viruses.